PIX/SEE Productions releases teaser trailer for new horror film “DEADLY REVISIONS”! 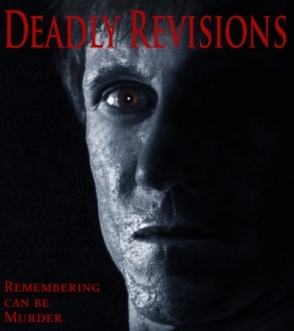 The official teaser trailer for “DEADLY REVISIONS” goes public to scare up interest in the horrors to come. March 18, 2012 - PRLog -- Film fans can now get a sneak peek of writer/director Gregory Blair’s DEADLY REVISIONS with the teaser trailer just released this week. Tight and tense, the teaser is guaranteed to peak interest and leave people wanting more. Horror movie favorite Bill Oberst, Jr. appears as Grafton Torn—a man haunted by terrifying images that may or may not be lost memories. Filled with classic horror images, the trailer fulfills the promise Blair has put forth that the film is a valentine to the genre: hatchets, bloody knives, guns, creepy shadows and more flash across the screen in a phantasmagoria. Clever metaphoric images are juxtaposed to augment the mystery: a finger furiously hits the “delete” button on a computer in between shots of bodies being dragged across a floor and bloody knives being washed in a kitchen sink. One question becomes clear: has Grafton deleted parts of his life for real? Co-producer Roxy Shih of Good Kids Productions said “Gregory’s script was so smart and twisted, I knew he’d come up with a trailer that would be a great example of what was to come”.